Mumbai, Mahabaleshwar, Lonavla, Lavasa, are the few patent names that strike our mind when thinking about the tourist places in the state of Maharashtra. To your surprise, the state has treasured some of the gems unexplored since years. With the evolving trend of travel and tourism, several amazing places are discovered by travelers in various parts of India. In this blog, we would like to bring your attention to the unexplored tourist places in Maharashtra. The next time you plan a trip to the state, do something offbeat and unique. Lying between the lush green forests of Matheran and plateaus of Panvel is the rumored Kalavantin Durg Fort. IT is said to be one of the most dangerous forts to conquer. Constructed during the reign of Bahmnai Sultanate, the fortress is guarded by nature since then. If you are someone interested in adventure, the trekking trail through the rock-cut stairs leading to the top of the fortress will bring you great thrill. Located 250 kilometers from Nagpur, Chikhaldara is the only coffee estate in the state. Despite being one of the important places to visit in Maharashtra, Chikhaldar experiences fewer crowds of tourists annually. This is turn keeps its natural beauty maintained at its height of 1080 meters from ground level. You can easily reach the place as it is well connected to cities like Nagpur and Amravati by road. The best way for last minute planner is booking last minute flights to the nearest airport and drive to Chikhaldara. Connecting the Konkan Coastlines from the hilly areas of Pune, this offbeat location comes alive in monsoons. The encompassing landscape around Tamhini Ghat looks like a red earth adorned with small shrubs, creepers and blanket of mosses during monsoons. The rushing winds and frequent avalanche of waterfalls makes it an ever pleasant trip across the state. Though you will have to cross potholes on the ride to Tamhini Ghat but the scenic beauty around will pay off that pain. 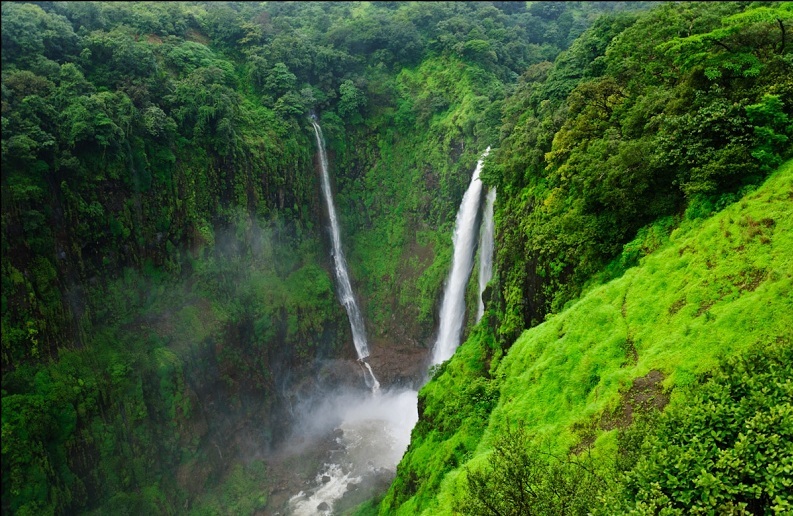 Thoseghar falls is situated at a short distance of 20 kilometers from Satara city. The lush, heavy and tall waterfalls come originates at a height of 1000meters from ground. Imagine the phenomenal sight! It is one of the unexplored places in the Konkan region of Maharashtra. You will love the place for its luxurious woody slopes, the lake in the proximity and of course the high waterfall. Moving a little further from Thoseghar is a hilly land of windmills, you can also allure the beautiful view from the spot. Stroll merrily in the Morachi CHincoli farmlands in company of the national bird Peacock. Doesn’t it sound surreal? Morachi Chincholi is a small village no less than a hidden treasure in the state of Maharashtra. The peacocks roam freely all around the village as if they are the only lawful residents of the area and the villagers are just visitors. Eventually, the village is on the way to become a hotspot for agri-tourism in Maharashtra. Today’s fast city life has left us in the chaos of the modern lifestyle. Are we still capable to imagine a world exists in its own charm and on its own terms? Purushwadi in Maharashtra is one such village boasting one of the best views of nature to the onlooker. Drive to this small yet beautiful village near Mumbai and engross in its unparalleled scenic beauty. From May 23 to July 6 each year, the Purushwadi valleys take a new birth as millions of fireflies are seen dancing in a united fiesta. These fireflies are in their mating rituals while they fleet around from tree to tree dancing with joy. A view so exceptional! Booked business class flights for an important business conference in Mumbai during this period? Wow! It is a great opportunity to capture this view in your camera. As said, there is a lot more than Mahabaleshwar and Panchgani in Maharashtra, go beyond these usual travel expeditions and explore Tapola, one of the unexplored places near Mahabaleshwar. Drive a little farther from the all-year packed Mahabaleshwar to this awe-striking place – Tapola. Located at a short distance of 150 kilometers from the city of Pune, you can take an easy drive to Tapola. Also given the name “Mini Kashmir of Western Ghats”, Tapola is a place rich in scenic beauty and water activities. You can indulge in varieties of water sports and explore the surrounding forts and jungles such as Vasota. What more can you expect when you have got all the peace in the world at this beautiful place in Maharashtra.